Within 50 years of Shakespeare’s death, England changed enormously: it had seen years of political and religious strife, civil war, regicide, and restoration. Throughout the early 17th century, Puritans believed theater—and players—to be morally suspect. In the 1640s, at the outbreak of the English Civil War, Parliament—then-dominated by the Puritans (including Oliver Cromwell (1599-1658), who later became Lord Protector)—claimed that public gatherings like stage plays posed a detriment to stability in dangerous times, and that the theaters themselves may have been involved in seditious activities. In 1642, Parliament closed the theaters, claiming that because they were “spectacles of pleasure, too commonly expressing lascivious mirth and levity: it is therefore thought fit… that …public stage-plays shall cease, and be forborne.” Many playhouses, including The Globe, were torn down later in the decade. In 1649, a true spectacle occurred not in a theater, but in the street: King Charles I was publicly beheaded. Charles II was restored to the throne in 1660 and reopened the theaters. By that time, literary, print, and theatrical cultures had changed: people read, printed, staged, and interpreted the plays in new ways for audiences whose experiences and tastes were vastly different from those of half a century earlier. Writers, printers, publishers, theater managers, and actors created a new Shakespeare on page and stage. At the same time, these creators exploited Shakespeare for personal and financial gain. The next two sections explore the refashioning of both Shakespeare and his plays after his death, initiating a process that continues into our own time. With the theaters closed between 1642 and 1660, the publication of new editions of Shakespeare’s plays almost entirely ceased: only Othello and The Merchant of Venice appeared in print. But the mere fact that Shakespeare was not published or performed did not stop people from talking and writing about him in the mid-17th century. John Ward, vicar of Stratford-upon-Avon, filled books with notes on religion, literature, and random gossip. He makes several references to Shakespeare (including the only known anecdote concerning his death), and wonders “Whether Dr. Heylin does well in reckoning up the dramatic poets which have been famous in England, to omit Shakespeare.” “Dr. Heylin” was the clergyman and historian Peter Heylyn, who did not include Shakespeare among the best English dramatic poets in his Cosmographie in Four Bookes –the most comprehensive description of the known world written in 17th-century England. Despite the fact that the Puritans disdained the theater, they often deployed Shakespeare in political tracts against Charles I, who read and annotated a folio edition of Shakespeare’s plays while imprisoned during the year leading up to his execution in 1649. In his pamphlet defending Charles’s execution, John Cook asserts that if the king had “studied Scripture half so much … as Shakespeare” he might not have come to such an unfortunate end. The poet and polemicist John Milton uses Shakespeare’s words against the king, accusing Charles of dissembling and hypocritical piety–similar to the villainous Richard III. In the 1660s, Francis Kirkman, the English writer, publisher, and bookseller began reissuing plays written earlier in the century. In 1661, he published a catalogue of all English plays printed up to that year—with the list running to 690 plays. Kirkman claimed to have read them all, and was ready to sell or lend them “upon reasonable considerations.” Kirkman’s list is one of the most important sources for the history of 17th-century English drama. And takes their cash – But where’s the Book? Johnson’s completed volumes were worth the nearly decade-long wait, with the Preface becoming one of the most important critical statements about Shakespeare of the eighteenth century, influencing readers for centuries to come. After the Restoration of Charles II in 1660, theaters reopened to audiences whose tastes had changed. Playgoers now favored witty comedies, particularly those featuring men and women who begin the play as adversaries and end up as romantic partners. The writer and theater manager William Davenant adapted Shakespeare’s Measure for Measure into a new play called Law Against Lovers, which also incorporates Beatrice and Benedick from Much Ado about Nothing. During the late 17th century, Shakespeare first appeared on stage as a character. In Charles Gildon’s adaptation of Measure for Measure, an actor playing “Shakespeares Ghost” performs the Epilogue, grumbling that his plays have been mangled by writers, and that he is being murdered nightly on stage by bad actors. The speech is more than a bit ironic, as Gildon had heavily revised the original play. John Downes’s Roscius Anglicanus is the most important primary source for the Restoration stage. From his position as the prompter at the Duke’s Theatre, Downes had an insider’s vantage point. He provides cast lists for countless plays, information on the success or failure of many pieces, and incidental comments on his own preferences. In this book, Downes describes a production of Hamlet starring one of the most famous actors of the late 17th century, Thomas Betterton. By the 1660s, Shakespeare was regarded as old-fashioned and of little interest to audiences. But the fact that Shakespeare was long-dead made him rather attractive to theater managers, who could adapt and perform his plays as they saw fit, without having to pay him or listen to his complaints about their productions. William Davenant, the manager of the Duke’s Theatre in Lincoln’s Inn Fields, saw great potential in Shakespeare’s works, particularly the tragedies. Davenant’s hugely popular production of Macbeth featured a musical score and moveable scenery and paid special attention to the witches. In his marketing of the play, Davenant emphasized his technological stagecraft, including dynamic scenery, machinery, and other new inventions. In the 1670s Davenant also adapted The Tempest, in collaboration with the writer John Dryden. The two added a number of characters, including a second daughter for Prospero, a girlfriend for Ariel, and a sister for Caliban. This adaptation of the play was performed until the 1840s. Thomas Duffett’s Mock-Tempest is a parody of both the Davenant-Dryden production as well as a 1674 operatic adaptation by Thomas Shadwell. The Mock-Tempest is set in a London brothel and casts Ariel as a pickpocket, alongside various wenches, prisoners, devils, and a Quaker character (the Duke of Mantua’s son) called Quakero. Nahum Tate produced another popular 17th-century adaptation with his King Lear, in which Lear and Cordelia live, Lear regains the throne, and Cordelia marries Edgar. The happy ending reflects Tate’s Royalist leanings and the desire not to show a king being usurped and murdered on stage–a story that was perhaps a bit too similar to the events of the English Civil Wars. Like the Davenant-Dryden version of The Tempest, Tate’s adaptation was the standard production of King Lear for the next 150 years. In Shakespeare’s lifetime, women did not appear on the stage in England; instead, young boys played female parts. The reopening of the theaters in the late 17th century ushered in new theatrical practices, including the appearance of actresses, in part because King Charles II had seen women on stage during his exile in France and the Netherlands. The first production to feature professional female players took place on December 8, 1660, in a production of Othello. In the 18th and 19th centuries, women breathed new life into Shakespeare’s heroines as public interest in female performers both on and off the stage intensified. The actress Sarah Siddons (1755-1831) was the greatest English tragic actress of her time; she was the sister of the actors John Philip Kemble and Charles Kemble, and the aunt of the actress Fanny Kemble. She made her stage debut in London in 1775, and in 1779 she gave her first performance as Lady Macbeth, the role for which she became best-known. Her performance in the sleepwalking scene drew the greatest acclaim, and at her final performance in 1812, the audience cheered so loudly and for so long that the play had to be concluded at that point. Helen Faucit (1817-1898), the acting partner of William Charles Macready (1793-1873), played the roles of Juliet, Portia, Desdemona, Cordelia, Rosalind, and Beatrice. Although many critics accused her of having a dated style of acting, an attendee at one of her final appearances on stage—as Rosalind, in 1879, at the age of 62—recalled that the performance evoked intense admiration from the audience. Frances “Fanny” Kemble (1809-1893), daughter of Charles Kemble, first appeared on stage at the age of 20 as Juliet at Covent Garden. She was an immediate success, and played all the principal women’s roles of the time. In addition to touring in England, she also performed to enthusiastic audiences in America. The English actress Ada Neilson (1847-1880) also found success in America, making her New York debut in 1872 as Juliet; her repertoire also included Rosalind, Viola, and Beatrice. She retired from the stage shortly after her 1879 Chicago performances and died tragically the following year. Sarah Bernhardt (1844-1923) was one of the most famous actresses of her day. In 1899, at the age of 55, Bernhardt took on the role of Hamlet in Paris; in 1900, she performed the part in London and America as well. 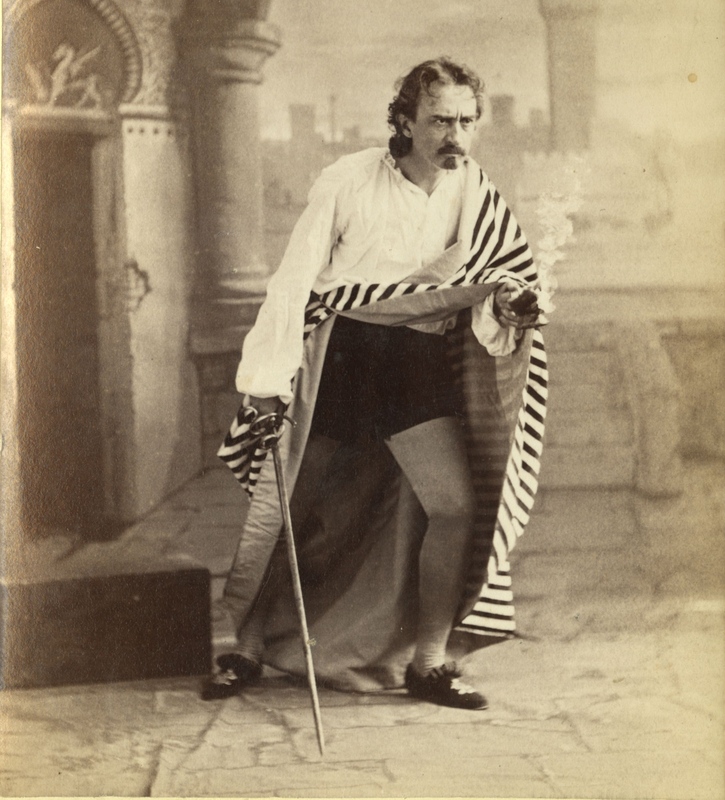 On stage, Hamlet had often been portrayed as embodying feminine qualities, but Bernhardt took this a step further, declaring, “‘I cannot see Hamlet as a man. The things he says, his impulses, his actions, entirely indicate to me that he was a woman.” Bernhardt was also the first person to portray Hamlet on film, appearing in the two-minute Le Duel d’Hamlet, produced for the Paris Exhibition of 1900. The American Ira Aldridge (1807-1867) was the first black actor to appear on stage in England. He made his debut as Othello in London at the Royal Coburg Theatre (now the Old Vic) in 1825. Although he was born in the United States, Aldridge created the myth that he was the descendant of a Senegalese prince whose family was forced to escape to America to save their lives. Aldridge became a star, with the critics calling him “African Roscius” (Quintus Roscius Gallus (d. 62 BC) was a Roman actor of such celebrity that his name became an honorary epithet for any highly successful actor). Aldridge forged a remarkable career in England; in addition to Othello, he also played King Lear, Macbeth, and Richard III. Othello was revived after the Restoration, and has been one of Shakespeare’s most performed plays ever since. The role of Othello was typically played by a white actor in blackface until the 20th century. Edmund Kean (1787-1833), one of the most famous Othellos of the 19th century, was renowned for his frightening and animalistic portrayal; he died after collapsing during Act IV of the play in 1833. Charles Kean (1811-1868), followed his father into the profession, but drew less enthusiasm from the critics, who described him as plump, facially expressionless, and vocally nasal. Kean’s wife, Ellen Tree, with whom he often acted, was a formidable talent who helped to elevate his performances. Kean later found greater success as the manager of the Princess’s Theatre in London.